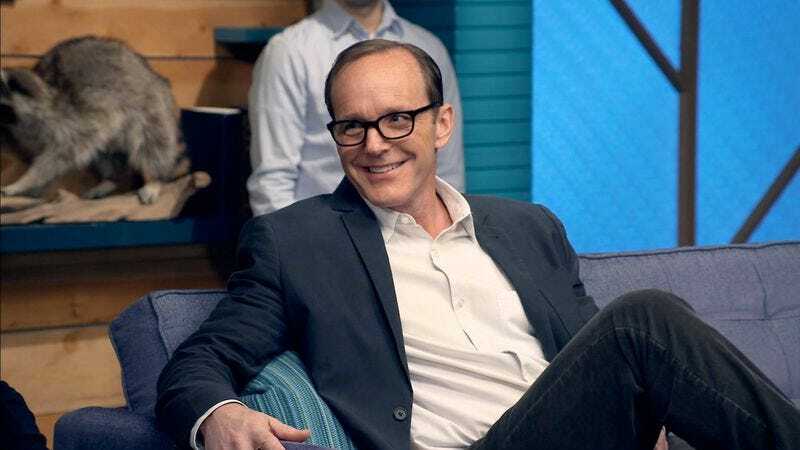 "Clark Gregg Wears A Navy Blazer & White Collared Shirt"
The absolute worst episode of Comedy Bang! Bang! ever made could get a passing grade from me as long as it had Harris Wittels standing in the corner of the set the whole time. And this was hardly the absolute worst episode! It was a particularly peculiar one, with Clark Gregg setting an impish tone as the celebrity guest that Neil Campbell and Andrew Rannells proceeded to match and eclipse with an extremely wacky character guest segment. Nestled on IFC during the Thanksgiving weekend, I doubt this episode will get a ton of eyeballs, but that’s kinda too bad. The only bit that carries over throughout the episode is Wittels’ performance as a temp hired to read the lines for Bookie the talking book this week. Harris Wittels is pretty much my favorite comedian alive, and since he’s a crucial recurring guest on the podcast, it’s always great to see him on the show, even if his Foam Corner has never been featured. He’s made a couple of brief appearances before, but this was his most sustained performance yet and I enjoyed the capper at the end of the episode with Wittels ranting at his dad on the phone. Didn’t have to have it there, but it gave the episode a more complete feel. Clark Gregg is adorable and I love him even if I’m basically just bashing Marvel’s Agents Of S.H.I.E.L.D. in my reviews at this point. I’ll always remember his work on The New Adventures Of Old Christine fondly. The man has comic chops! He came into the episode feeling more prepared for antics than some of the guests, and there’s a few silly bits about boring props from the Marvel movies, him pointing a gun at Scott and shooting him, you know, the usual kind of stuff this show does. Probably my favorite Clark Gregg bit of the night was his and Scott’s halting attempts to name the Stephen King novel “Cujo,” tossing out too many good ideas to mention, but some of my favorites were “Lisa Cujo and Courtney Cox” (that one from Wittels) and “Cujo the Sharp-Toothed Mutt.” They decide on “Just Cujo” before Reggie reminds them that it’s “The Langoliers,” which is about as inside a Stephen King reference as you’re gonna get. Reggie got his own sketch for the first time in a little while here, a cute fable of him trying to find love that ends in heartbreak, and then has another, even funnier, twist in its final moment. I want more Reggie skits on the show! It’s perhaps redundant to say this about a professional comedian (although Watts certainly occupies his own unique ground in the comedy world) but he has such a naturally funny air about him. When he walks around, I’m reminded of Ringo Starr in A Hard Day’s Night. Yes, that’s the comparison that comes to mind, for some reason. He’s so immediately lovable and funny on top of it. Neil Campbell’s in-character appearance as Cody Gossman was, well, a very Neil Campbell bit, as he advocated for a no-spanking holiday for all of the country’s bad little boys, quickly transitioning into an earnest musical number. I was on board, but the twist of Rannells marching on stage in short pants and speaking for the nation’s “good little boys” elevated the bit from cute to great (it stayed cute, too). Not to forget, it was also totally creepy, with Rannells singing lines like “If I don't want a spanking, I don't tear sister's dress!” There was only one way for the night to end, and that was with Scott throwing Neil over his knee and spanking him (and having Rannells join in). Happy Black Friday, everyone. James Adomian pops up again as the taxi driver in Reggie’s sketch.